One day about twenty years ago, in the early days of the Flying Pig, a vigorous middle-aged woman walked up to the counter to make her first purchase. We needed to set up her customer account, so we asked her name. “Betty Miles,” she said. “Betty Miles!” I exclaimed. “There was a children’s book author I used to love by that name. She wrote a bunch of novels.” “Well,” she said, “That was probably me.” And it was. I still have my copy of this vinyl record. Just looking at it makes me smile. 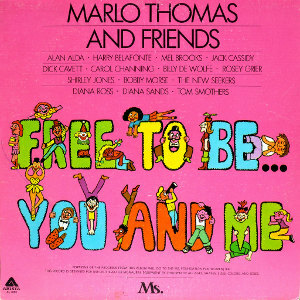 In case you aren’t familiar with Free to Be, it was a 1972 book and record album that gathered together “stories for free children,” as Ms. Magazine called them. These were stories that defied gender stereotypes and celebrated gender and racial equality.The record featured Marlo Thomas, Alan Alda, Rosey Grier, Mel Brooks, and a host of amazing actors and singers performing poems, stories, plays and songs. It was a formative album for a generation of children, encouraging individuality, honoring children’s hopes and fears and feelings, and doing it all with humor and energy. There were 14 authors represented in the original book, and Betty Miles was one of them. Her “Atalanta” was a retelling of the Greek myth about a strong, fiercely independent young woman. The original myth is fairly bloody; Betty Miles’ retelling omits the boar hunting and the beheading of the vanquished suitors, while keeping the core of the myth: Atalanta wants to choose her own future. So Atalanta trains for the race, day after day. Unbeknownst to her, a young man from the town is also training just as hard. “Atalanta told John about her telescopes and her pigeons, and John told Atalanta about his globes and his geography studies. At the end of the day, they were friends. That same night, John set off by ship to discover new lands, and Atalanta set off on horseback to visit great cities. The king stayed home and thought about how the world was changing. It would be hard for a girl today to understand how revolutionary this story ending was to a girl in the 1970s. This was the first fairy tale I ever read that told me I could choose a life of adventure, of independence. That along the way I might find boys who were my true friends, who wanted to stand beside me as equals, who valued my hopes and dreams as strongly as they valued their own. This story told me I could explore the world, at my own pace, and in my own way. This story was freedom. I can’t emphasize enough how important “Atalanta” was to my sense of self and possibility. When Betty mentioned today, in an almost offhand way, that “Atalanta” was hers, I felt a huge, unexpected wave of emotion. My throat lumped up with a wallop of gratitude that overwhelmed me. I managed to keep the tears at bay, but I told Betty it was my favorite of all those favorite stories and songs, the one that meant the very most to me. Later, at dinner, I told a friend that I’d discovered one of our customers was the author of “Atalanta,” and she immediately welled up with tears. “That story changed my life,” she said, telling me her own version of what I’ve just shared with you here. That story changed lives, indeed. I don’t think Betty Miles has any idea how powerful her short story was for thousands upon thousands of girls. I think of the authors today who are writing books in which children of color can see themselves, see lives unfolding with brilliant hope and potential, and wonder who, someday, will meet a bookseller 45 years later who will tell them, “You changed my life.” To those authors: keep writing. It means more than you’ll ever even imagine. This entry was posted in Uncategorized on October 7, 2016 by Elizabeth Bluemle. Thank you for this! What a delight to read. That whole album was revelatory for me as a kid. (The only ones I just didn’t understand were Toyland and Don’t Dress Your Cat in an Apron. Why wouldn’t you dress your cat in an apron if he’s learning to bake? It only seems practical!) I adored Atalanta — and the interplay between Thomas and Alda — immensely.